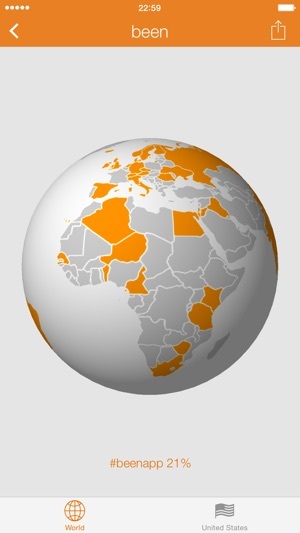 Keep track of countries and US states that you have visited. 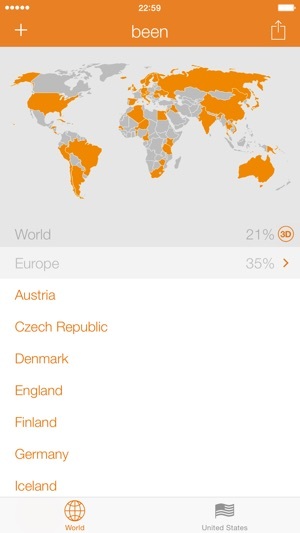 The app visualizes the visited countries both as a list, along with a ratio for each continent, and as a world map. The list is synced across devices using iCloud. The map can be shared on social networks, such as Instagram, Twitter and Facebook, using the standard iOS sharing functionality. NOTE: For users who are having problems adding countries to the world map: Tap the + button in the upper left of the World tab. Ok this is going to sound funny but, I play Pokémon go and i started collecting Pokémon that are called alola they come from eggs that come from gifts that friends send you. Well I was getting bored and decided to collect certain ones from all the states and certain ones from all the countries. This app works great for doing this it makes it so easy and I love the 3D planet. My only complaint so far is that we should be able to save or export what we have highlighted from one device to another. Or have it save on the cloud of some sort. When that is available or possible I will give it a 5 star till then 4 star but keep up the great work. 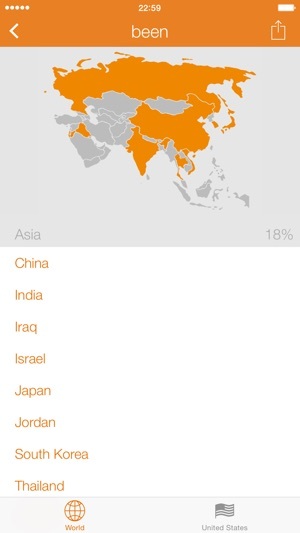 I just downloaded the Been app and it is missing some territories and miscategorizes some others. For instance, the US and British Virgin Islands are not listed at all. Not categorizing the BVI as a separate entity from the UK seems wrong. You have not visited the UK if you’ve only visited the BVI, and going to London isn’t the same thing as visiting the BVI. Same with the USVI. Also, Puerto Rico is listed as a separate country from the US, which is obviously not the case. Puerto Rico has been a territory of the United States for 119 years. Washington DC is almost not listed anywhere. 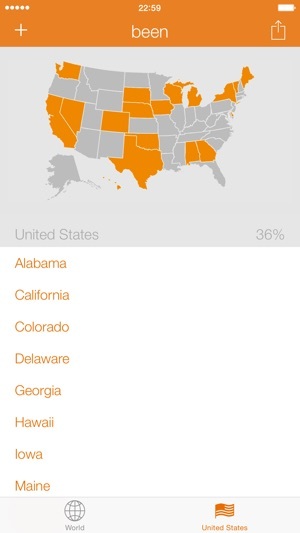 IMO all US states and territories should be included in the listing as “states” for the “United States” view. For other countries, that country’s territories should be listed as separate countries in the “World” view. Don't get me wrong, this app is great. I've been using it for quite a while now and it's a great way to keep track of your travels. 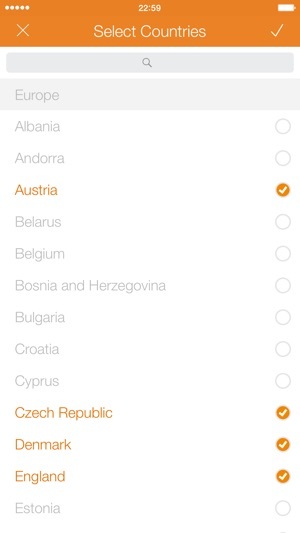 It's also the best app out of the many options out there for checking countries/states off your list. Although, I think the app could be even better by adding the ability to check off territories, islands, Canadian provinces, Australian states, Hawaiian islands, etc. It’s too bad the developers haven’t been very active in updating things. Hopefully they make these improvements so we can start having even more fun with the app!